PRICE CHANGE. 2019 appraisal is $162K & bank is looking for pretty close to asking price - SOLD strictly AS-IS. 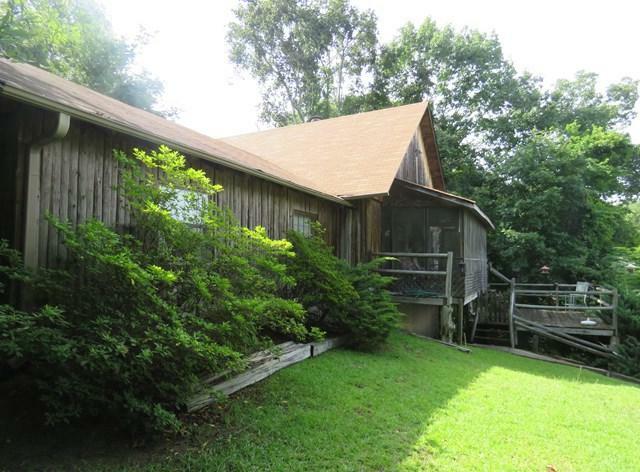 Your rustic mountain home on Lake Greenwood! This is not a log-home & it's not in the mountains, but this site-built home has a lot of neat unique features you'll really like. Western red cedar wood inside & out. Love the interior w/ awesome 18-20' high vaulted ceilings & exposed western cedar log beams, warm quality wood paneling & ceilings thru-out, pretty hardwood flooring, & solid character doors. 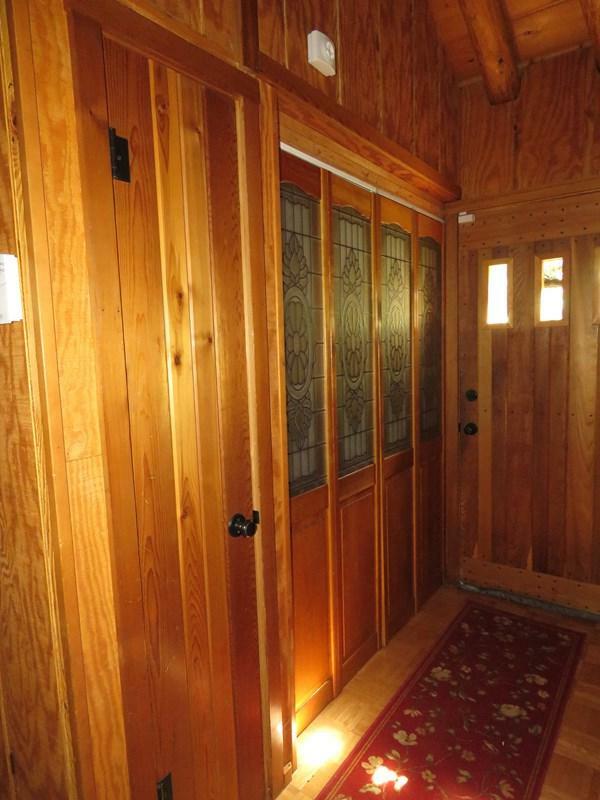 Upon entry, notice a storm door & a real Foyer w/ two closets & a half-bath. On the home's right side is a large 24x14 room you could make a formal LR, a Rec. 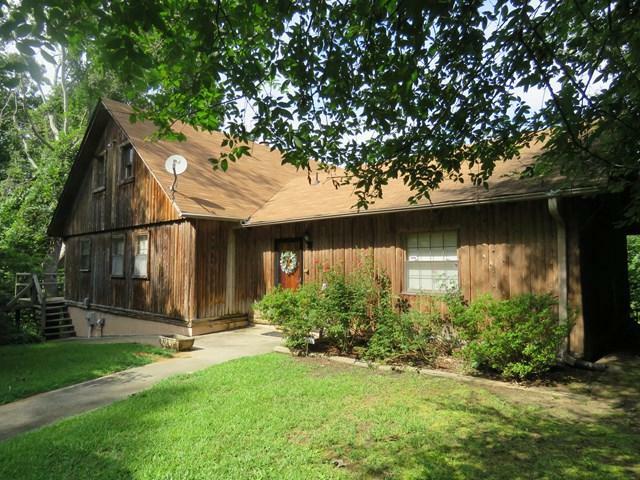 Rm, or a Whatever Rm- it has the high ceiling & exposed logs that give this home so much appealing character. Two Bedrooms are on the main floor, including a Master (approx. 12x12) that has 2 walk-in closets, & a spacious Ensuite Master Bath remodeled in 2008 to be handicapped-accessible w/ a roomy easy-in/out custom tiled shower & convenient built-in bench. You'll love the 2nd Bedroom too, (approx. 12x9) w/ its soaring half-vaulted ceiling. On the home's left side, the hardwood-floored Family Rm/Dining Rm combo Great Room is approx. 28x14 & has 4 lakeside windows to enjoy the view, a brick pad for an extra gas heater (not hooked up- what do you want to put there?) & a door to the Porch. The Great Rm also has a wonderful vaulted beamed ceiling, which allows a loft area to serve as the third Bedroom, w/ its own full private bath. There's plenty of room up there if you want to throw in another mattress for the kids & a little table/office corner, plus there's a spacious enclosed storage area- not tall enough to be called a closet, but perfect for a lot of stuff-stashing. Back on the main floor, the Kitchen is adorable a welcoming space w/ swinging saloon doors from the Great Rm, wood ceiling, newer fan, lots of cabinet storage w/ rope lighting underneath, & a cute little breakfast bar. It was remodeled in 2007 w/ new tile flooring, countertops, stove, and dishwasher. Disposal/stainless sink replaced in 2012. Head Downstairs to a large unfinished basement that offers all kinds of possibilities. Laundry is currently stationed there, (there is also a hookup in the main floor Foyer closet if you want to reconfigure). There is a sump pump in the basement (installed 2004/unwarranted), but w/ 800'+ sqft of space, 8' height ceilings & concrete block walls, there's loads of room for storage, or you may want to model into some kind of living space. It has a couple of windows on one side, a super-cool saddle-door going outside (open half the door), a shower stall, & utility sink. This square footage is not included in the home's listed SqFt- which is estimated at 1550' on the main floor, 345' for the loft, (& 800+ for the basement). Outside- note the concrete driveway with back-up pad, + 2-car carport. Note: You MUST be OK with stairs. This home is built on a short, Steep Bluff with stairs to the water, offering a pretty, elevated panoramic lake view with privacy from neighbors & fishing boats. New owner could open up the wonderful vista even more without sacrificing privacy. Roof replaced in 2011 but needs work or replacing. 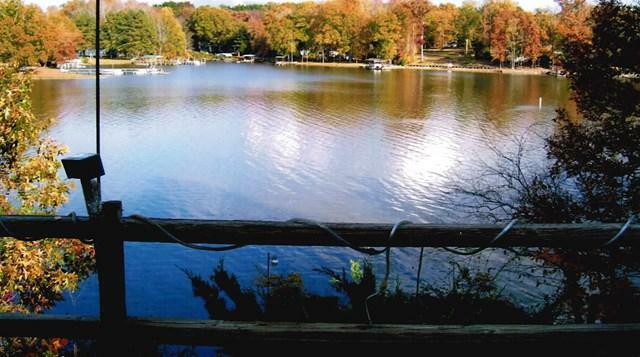 Decks, dock, & stairs to the lakeside are old & unsafe; you'll likely want to replace. Home needs Carpenter bee treatment, holes need plugging; house exterior needs sealing/staining, there is a foundation corner issue and sill repair that we have quotes on. So yes, the house has several needs and is indeed a Fixer-Upper, but this home is unique in the Best Ways. Cool enough to be your Mountain Break at the Lake,' and certainly nice enough to be a full-time residence. Great character! No-HOA lake neighborhood on a quieter section of beautiful 11,400-acre Lake Greenwood. NOT AVAILABLE FOR RENT. Make your offer, get the process started & LOVE YOUR LAKE LIFE!